This romantic hand painted silk robe and gown set features one of the most beautiful paintings in our collection. 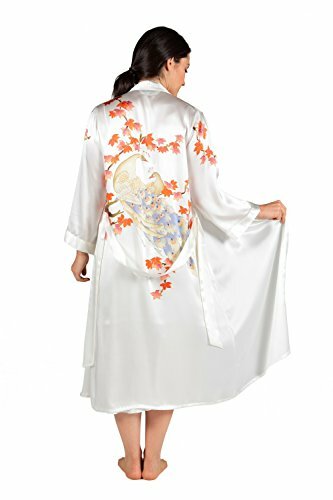 On the back, the robe features a pair of majestic peacocks perched on a tree brimming with deep autumn colors. The painted leaves flow over the shoulders, onto the front of the robe and front of the gown. Each garment has been carefully hand painted. A great gift for any occasion!